We were delighted to share the weekend of January 17-18, 2015 with so many friends at the First Annual Women Instructors Friendship Seminar hosted by Open Sky Aikido & Tai Chi in Hillsborough! Instructors from six different dojos led the weekend, including Katie Haywood, 4th dan from Open Sky, Takiko Noehl, 4th dan from Seibukan Aikido Dojo in Raleigh, Leslie Kausch, 4th dan from Greensboro Kodokan Aikido, Connie Truemper, 4th dan of Aikido Schools of New Jersey, and Charlene Reiss, 4th dan from Triangle Aikido. More than 60 students came from across North Carolina and beyond for a fun-filled weekend of great Aikido and warm fellowship! Happy Holidays from Triangle Aikido! Wishing everyone a very happy new year! Come see us in 2015!! We had a great time celebrating Hiroshi Tajiri Sensei's 45 years of practicing Aikido with special guest, Ed Germanov, 5th dan from Tendokan Dojo in Sofia, Bulgaria. Tajiri Sensei, 6th dan, is the head instructor at Seibukan Dojo in Raleigh, NC and a long-time friend of Triangle Aikido. It was an honor to participate in a fun, informative weekend of Aikido, musogi, and calligraphy. Best wishes for many more years of Aikido, Tajiri Sensei! The First Annual North Carolina Women's Seminar on June 28-29, 2014 was a great success! Greensboro Kodokan Aikido and Triangle Aikido co-hosted the event that brought together 18 women from across the state for two days of energetic, fun, focused training. Our five instructors (front row l to r) - Takiko Noehl, 4th dan, Seibukan Aikido; Charlene Reiss, 4th dan, Triangle Aikido; Katie Haywood, 3rd dan, Open Sky Aikido; Krista Kasdorf, 2nd dan, Raleigh Aikikai; and Leslie Kausch, 4th dan, Greensboro Kodokan Aikido - provided training in a variety of styles on the theme of "Soft Power: Aikido without Injury." While everyone greatly enjoyed the opportunity to work with more female Aikidoka, the group emphasized that most of their male dojo-mates were disappointed to miss the training with different instructors. Stay tuned for information on a future seminar with the same instructors - this time open to all students! Always a great time when our friends from Seibukan come to visit! Thanks to Tajiri Sensei and Danieley Sensei for a fun, interesting, high-energy seminar in April! We had a WONDERFUL Aikido demonstration with the Lambda Phi Epsilon fraternity from Duke University on Sunday, March 23. What a joy to share our passion with so many energetic, focused, and good-spirited young men! We hope we'll be seeing more of them at our dojo! Thanks to everyone who attended the Third Annual Piedmont Friendship Seminar at Alamance Community College on April 25, 2015. Everyone had a great time with six instructors from across North Carolina! Always great to see everyone and learn new things! 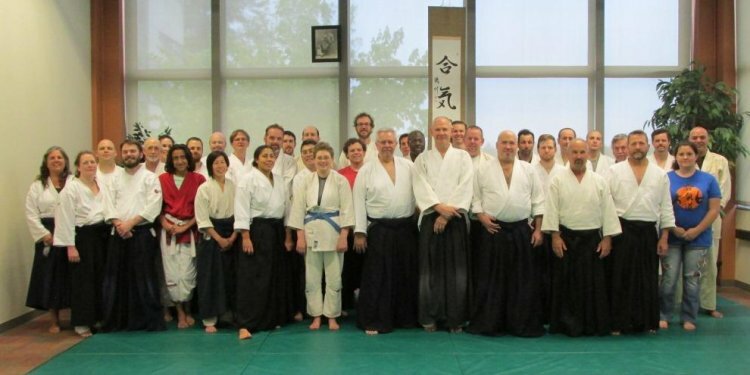 Many thanks to Bob Garza Sensei from Sosei Aikido Kyokai in Worth, IL for joining us at our Shochugeiko, July 24-26, 2015. From sword cuts to kata to calligraphy, it was a wonderful, informative, challenging, and laughter-filled weekend. We look forward to Garza Sensei's next visit!